Ultra Portable Speakers Market Segmented By - Ultra-Portable Speaker technology type Bluetooth, Wi-Fi, Others; Ultra-Portable Speaker end-user type – Residential, Commercial; Ultra-Portable Speaker distribution channel type - Organized retail, Unorganized retail, Online/ecommerce. Persistence Market Research offers an 8-year forecast for the global ultra-portable speaker market between 2018 and 2026. In terms of value, the ultra-portable speaker market is expected to register a CAGR of 12.1% during the forecast period. This study demonstrates the dynamics and trends of the ultra-portable speaker market globally across regions, such as North America, Latin America, Europe, SEA & Other APAC, Japan, China, and Middle East & Africa, along which their influence on the current nature and future status of the global ultra-portable speaker market over the forecast period. This research report provides a detailed analysis of the global ultra-portable speaker market and offers insights on various factors such as applications and developments of ultra-portable speakers. 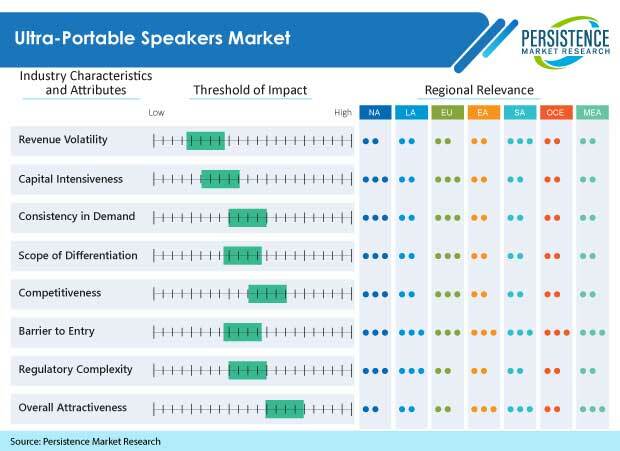 The ultra-portable speaker market study provides a comprehensive assessment of stakeholder strategies and imperatives for succeeding in the business. This ultra-portable speaker market report segregates the market based on technology and sales channels across different regions worldwide. Key players are introducing technologically advanced products, which is acting as a major driver of the global ultra-portable speaker market. The report starts with an overview of the global ultra-portable speaker market in terms of value. In addition, this section includes the analysis of key trends, drivers, and restraints that are influencing the global ultra-portable speaker market. Impact analysis of key growth drivers and restraints are included in this report to facilitate clients with crystal clear decision-making insights. The global ultra-portable speaker market is categorized on the basis of technology, end-user, distribution channel, and region. On the basis of technology, the market is segmented into Bluetooth, Wi-Fi, and others. On the basis of end-user, the global ultra-portable speaker market is segmented into residential and commercial. On the basis of distribution channel, the global ultra-portable speaker market is segmented into organized retail, unorganized retail, and online/ecommerce. A detailed analysis has been provided for every segment in terms of market size analysis of the ultra-portable speaker market across different regions. It provides a market outlook for 2018–2026, and sets the forecast within the context of portable speakers, which includes the latest technological developments as well as service offerings in the market. This study discusses key trends within regions that contribute to the growth of the ultra-portable speaker market, as well as analyzes degrees at which drivers are influencing the ultra-portable speaker market in regions. Key regions and countries assessed in this report include North America (U.S. and Canada), Latin America (Brazil, Mexico, and the rest of Latin America), Europe (Germany, Italy, France, U.K., Spain, Russia, and the rest of Europe), SEA & Other APAC (India, Indonesia, Philippines, Thailand, Malaysia, Oceania, and the rest of SEA), Japan, China, and Middle East and Africa (GCC countries, South Africa , Turkey, Northern Africa, and the rest of MEA). This report evaluates the present scenario and growth prospects of the ultra-portable speaker market across various regions globally for the period 2018 –2026. We have considered 2017 as the base year, and provided data for the remaining 12 months. The forecast presented here assesses the total revenue by value across the ultra-portable speaker market. To offer an accurate forecast, we have started by sizing the current market, which forms the basis of how the ultra-portable speaker market will develop in the future. Given the characteristics of the ultra-portable speaker market, we have triangulated the outcome of different services & components and analyzed based on technology trends. In addition, it is imperative to note that, in an ever-fluctuating global economy, we not only conduct forecasts in terms of CAGR, but also analyze on the basis of key parameters, such as Year-on-Year (Y-o-Y) growth, to understand the predictability of the market and to identify the right opportunities across the ultra-portable speaker market. In the final section of the report, we have included a competitive landscape to provide clients a dashboard view based on the categories of providers in the value chain, their presence in ultra-portable speaker portfolio, and key differentiators. This section is primarily designed to provide clients an objective and detailed comparative assessment of key providers specific to a market segment in the ultra-portable speaker value chain and potential players for the same. Report audiences can gain segment-specific vendor insights to identify and evaluate key competitors based on an in-depth assessment of their capabilities and success in the marketplace. Detailed profiles of providers are also included in the scope of the report to evaluate their long-term & short-term strategies, key offerings, and recent developments in the ultra-portable speaker market. Key competitors covered in the ultra-portable speaker value chain are Anker Innovations Limited; Beats Electronics LLC; Bose Corporation; Harman International Industries; Klipsch Group, Inc.; Sony Corporation; Xmi Pte. Ltd.; Koninklijke Philips N.V.; Samsung Electronics; and ULTIMATE EARS. Ultra-portable speakers are audio speakers that run on batteries, which can be easily carried & transported by users. Rapidly changing consumer preferences, continuous innovations in technology, and increasing adoption of smartphones are among factors fuelling the growth of the global ultra-portable speaker market. The sales of waterproof speakers are surging the global demand for ultra-portable speakers. Moreover, the emergence of high-resolution audio has gained momentum in the ultra-portable speaker market. Vendors are providing 24-bit high resolution audio speakers. There is significant consumer demand for high-quality audio, along with audio devices that are easily portable and can be carried anywhere to places such as homes, gyms, cars, workplaces, and others. This is driving the demand for ultra-portable speakers with features such as smaller size, light weight, high-resolution audio, compatibility with other devices and long battery backup. With continuous developments in wireless technologies, it is easier for consumers to stream music any time and at any place. Due to increasing outdoor activities and easy portability, Bluetooth ultra-portable speakers are expected to garner a major market share during the forecast period. Increase in the adoption of smartphones and seamless connectivity through Bluetooth technology is surging the demand for Bluetooth-enabled ultra-portable speakers. However, recent innovations in smart speakers are fuelling the demand for Wi-Fi-based ultra-portable speakers. Smart speakers, such as Amazon Echo Dot and Google Siri, are boosting the popularity of Wi-Fi-based portable speakers. This is encouraging consumers to opt for Wi-Fi-enabled ultra-portable speakers, owing to which vendors are offering multi-connectivity speakers that can be connected with Wi-Fi as well as Bluetooth. North America is expected to account for a major market share of the global ultra-portable speaker market during the forecast period. Technological advancements in various audio devices have transformed the way in which music is played and appreciated. The high subscription of music streaming and over-the-top streaming is creating high demand for ultra-portable speakers in the U.S. Several homes in the U.S. and Canada have been revamped into smart homes, and this is significantly contributing to the demand for ultra-portable speakers. North America is among the most technologically advanced regions. Vendors in this region are focusing more on the innovation and designing of products. Vendors are offering various features, such as waterproof speakers, rhythmic lighting, and improved battery backup, in ultra-portable speakers to increase their revenue sales. All these factors are expected to drive the global ultra-portable speakers market during the forecast period. Several players in the ultra-portable speaker market have started taking more interest in this market by investing in partnerships or by launching new featured ultra-portable speakers for the ultra-portable speaker market. For instance, in May 2018, Harman International Industries launched JBL GO2, a fully waterproof and ultra-portable speaker. JBL GO2 was launched in the Indian market with features such as small size, Bluetooth connectivity, next-generation audio quality, and others. Revenue generated by the global ultra-portable speaker market is estimated to exhibit a double-digit CAGR, and hence, reach US$ 4,095.1 Mn by 2026. On the basis of technology, the ultra-portable speaker market is segmented into Bluetooth, Wi-Fi, and others. Revenue contribution from the ultra-portable speaker Bluetooth segment is expected to increase at a CAGR of 11.8% during the forecast period due to the increasing adoption of smartphones and tablets. On the basis of end-user, the ultra-portable speaker market is segmented into residential and commercial. Revenue contribution from the ultra-portable speaker residential segment is expected to expand at a CAGR of 12.2% during the forecast period due to the high adoption of smart homes and increasing recreational activities. On the basis of distribution channel, the ultra-portable speaker market is segmented into organized retail, unorganized retail, and online/ecommerce. Revenue contribution from the ultra-portable speaker organized retail segment is expected to expand at a CAGR of 11.8% during the forecast period. However, with increasing ecommerce industry, vendors are adopting the online channel for sales. Owing to the ease of overseas business, vendors are moving toward the online/ecommerce sales segment. This trend is expected to contribute to the growth of the online/ecommerce segment of the ultra-portable speaker during the forecast period. On the basis of region, the ultra-portable speaker market is segmented into North America (U.S., Canada), Latin America (Brazil, Mexico, and the rest of Latin America), Europe (Germany, Italy, France, U.K., Spain, Russia, and the rest of Europe), SEA and Pacific (India, Indonesia, Philippines, Thailand, Malaysia, Oceania, and the rest of SEA), China, Japan, and MEA (Northern Africa, GCC Countries, Turkey, South Africa, and the rest of MEA). Revenue contribution from the North America region in the ultra-portable speaker market is expected to expand at a CAGR of 11.4% during the forecast period due to the high penetration of OTT and music streaming services. Key competitors in the ultra-portable speaker market are Anker Innovations Limited, Beats Electronics LLC; Bose Corporation; Harman International Industries; Klipsch Group, Inc.; Sony Corporation; Xmi Pte. Ltd.; Koninklijke Philips N.V.; Samsung Electronics; and ULTIMATE EARS.